Introduction: In athletics, muscles work in coordinated synergies to create movements and accelerate, decelerate, and stabilize forces. Athletic movements that are recruited by the nervous system are termed muscle synergies. Muscles synergies work as a coordinated unit to isometrically stabilize, accelerate, and decelerate forces during athletic movements and rarely work in isolation. There are four main muscular subsystems that you can develop with specific exercises in order to develop optimal performance in athletes. These include the anterior oblique subsystem, deep longitudinal subsystem, lateral subsystem and posterior oblique subsystem1. Figure 1: NASM essential sports performance training (Clark, 2010). 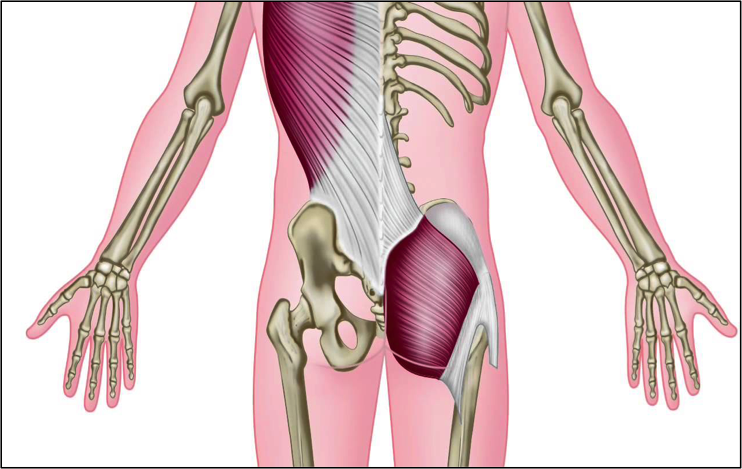 Overview: Muscles that make up the anterior subsystem are global movers of the anterior trunk and adductors. The AOS stabilizes the thoracic and lumber spine, sacroiliac joint, and muscle of the hip. 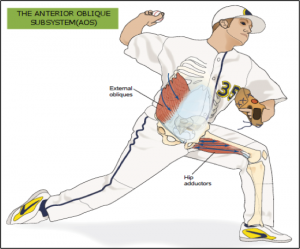 The AOS Assists in transferring force between the upper and lower extremities primarily during rotational movements in the transverse plane, such as in throwing and swinging a bat. Function: The (AOS) stabilizes the spine and the lumbo-pelvic hip complex during acceleration, deceleration, throughout all planes of motion. In baseball the AOS produces rotational force and hip flexion. Antagonist of the AOS is the POS. Muscles involved: Internal Oblique, External Oblique, Adductors, Hip External rotators, Rectus Abdominis. Overview: The DLS stabilizes the lumbosacral joint and medial longitudinal arch of the foot. It also eccentrically decelerates the leg during the forward swing and controls pronation and supination of the foot complex during heel strike through mid-stance. It primarily contributes to propulsion during high intensity ground reaction forces during running and sprinting gait motions. (Clark, 2014). Function: The DLS stabilizes the sacrum, and sacroiliac joint, and also plays a role in arthrokinematics of the foot/ankle complex. Controls ground reaction forces during gait. Muscles involved: Sacrotuberous Ligament, Biceps Femoris, Peroneus Longus, Anterior Tibialis. Exercises: Walking lunge, (skater hops) sagittal plane hop with stabilization. Figure 3: NASM essential sports performance training (Clark, 2014). Overview: The Lateral subsystem primary function is frontal plane stabilization and during single leg movement patterns. Stabilization of the Lumbo pelvic hip complex (LPHC), and transfers force between upper and lower extremities. 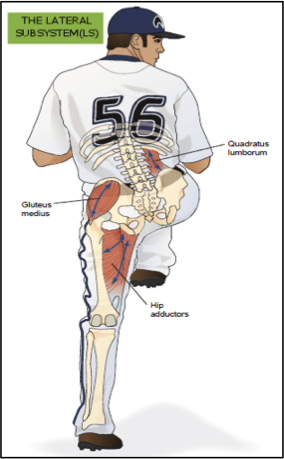 Function: Frontal plane stability- Controls the pelvis and femur during frontal plane functional movements such as in throwing. Muscles involved: Gluteus Medius, Adductors, Quadratus Lumborum. 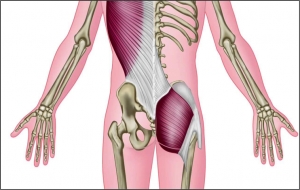 Overview: The posterior subsystem includes some of the largest muscles in the body. The main function of the POS is to stabilize the lumbar spine, Sacroiliac joint and muscles of the hip. 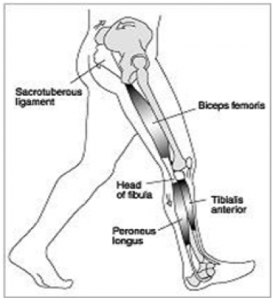 It also functions to transfer forces between upper and lower extremities. Muscles involved: Latissimus Dorsi, Thoracolumbar Fascia, Contralateral Gluteus Maximus. Function: The (POS) produces forces during running and sprinting and during rotational forces of swinging a bat or throwing a baseball. 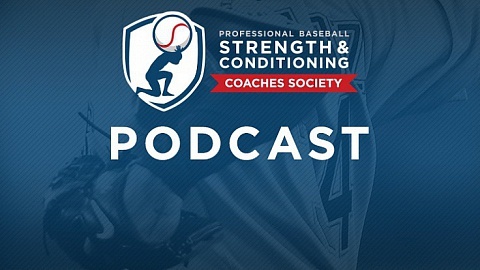 Functions in all pulling and rotational movement patterns, multi-segmental extension, and eccentrically decelerates spinal flexion and rotation, hip flexion, adduction, and internal rotation. Antagonist of POS is the anterior oblique subsystem (Clark, 2014). Exercises: Glute Bridges, Hip Thrusts, Split-stance cable rows, half kneeing cable-press opposing hand, single-leg RDL, Alt-Superman. Use in programing; Programs should utilize multi-joint multi-planer exercise that enhances the nervous systems’ ability to recruit subsystems (muscle synergies) through improved coordination of muscles working together as a unit. 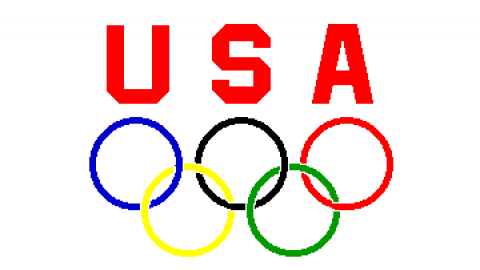 This is specific to sports that will enhance athlete’s quality of functional movements. 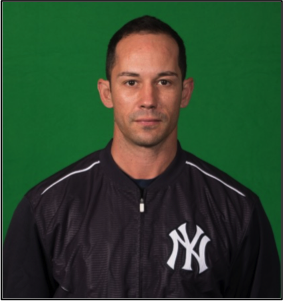 Anthony Velazquez, RSCC is a two-time Minor League Baseball Strength Coach of the Year (2016 and 2017) and is currently the Strength and Conditioning Coach for the Trenton Thunder, the New York Yankees Eastern League affiliate.